On Friday 25 March, Good Friday, Cardinal Vincent Nichols marked the Lord’s Passion in central London by attending the Walk of Witness in Westminster and the Wintershall Passion play in Trafalgar Square before celebrating the Solemn Liturgy of the Passion at Westminster Cathedral at 3pm. At 12pm, Cardinal Vincent took part in a procession with other Christians in a Walk of Witness along Victoria Street, from Methodist Central Hall and Westminster Abbey to Westminster Cathedral. The procession was led by a man carrying a Cross, symbolising Christ’s journey to his death. During the Walk of Witness Cardinal Vincent preached to the assembled crowd who had gathered to join the procession. After the Walk of Witness, Cardinal Vincent attended the annual Passion Play held in Trafalgar Square performed by the Wintershall Players where he led prayers. At 3pm, the Cardinal led the Solemn Liturgy of the Passion of the Lord in Westminster Cathedral. Also at the Liturgy were the chaplains of Westminster Cathedral, the Apostolic Nuncio, Archbishop Antonio Mennini, and Bishop Mark Jabalé, Bishop Emeritus of Menevia. On Good Friday, celebration of the sacraments does not take place; rather the Body of Christ, consecrated at the Mass of the Lord’s Supper on Maundy Thursday, is distributed during Communion. 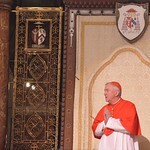 The full text of the Cardinal's homily is available here and photos are available to view here.